The Level 3 Equestrian First Aid At Work course is aimed at human first aid for anyone involved with horses where the First Aid at Work qualification is needed in addition to specific injuries involved when working with horses and a course tailored to equestrian subjects. 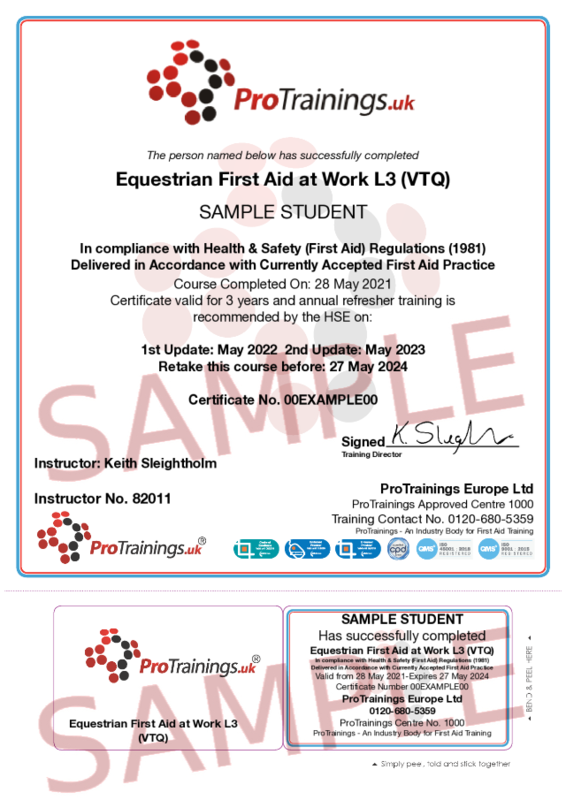 If you are involved in teaching riding or other activities you are required to have the BHS first aid qualification or the HSE First Aid at Work qualification. With this course we go one better and adapt a course that includes the approved FAW with extra subjects and apply the course the the equestrian world. The First Aid at Work course (FAW) is ideal for most businesses whose risk assessment has identified that they require a fully trained first aider for their workplace. This course is available as a ProTrainings CPD certified qualification, all courses are delivered, evaluated and quality assured to meet the new guidelines set out by the HSE in October 2013 and meet the requirements of the First Aid at Work (First Aid) regulations 1981. We also offer a basic one day course for those who do not need the qualification for teaching or professional reasons called Basic Equestrian First Aid.